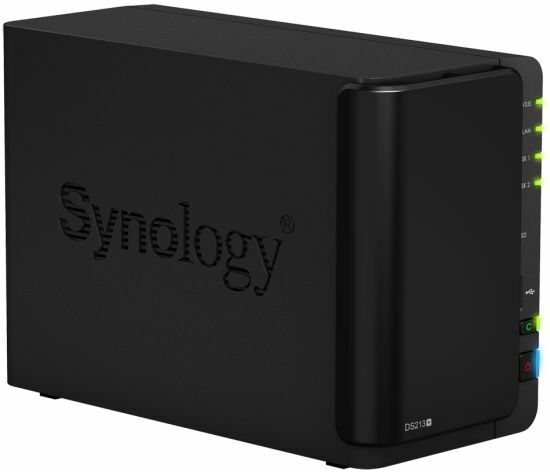 When I recently reviewed Synology's DS413, I was surprised at its high performance. The 413 uses a dual-core ARM-based Freescale SoC based on PowerPC e500 cores to produce throughput close to what I normally see from only Intel Atom-based NASes. The DS213+ is basically a two-bay RAID 1 version of the DS413, with similar performance. It's the only other NAS in Synology's current offerings to use the same Freescale processor. In a decision only understood by Synology marketing, the DS213+ is positioned as the entry-level product in Synology's "Standard Business" family, while the DS413 falls under the "Workgroups & Small Business" banner. And yes, there is a DS213 that is under the same "Workgroups & Small Business" umbrella. But it uses a 2 GHz Marvell Kirkwood SoC. Go figure. The 213+ looks like a slimmed-down DS413. It comes a mostly-plastic enclosure that I think is kind of chintzy for a business-class (and priced) NAS. The panel diagram below shows the ports and lights. Note the front panel SD card slot, which you don't get on the DS413. There's only one Gigabit Ethernet port and one USB 2.0, one eSATA and two USB 3.0 ports. Note that there are no VGA or HDMI ports to support an attached console, nor is there an LCD status panel on the front. The plastic Synology cases require care to open up. Fortunately, the folks at techPowerUp have a nice set of inside pictures in their review, which is where most of the information in Table 1 comes from, as does the board photo. Synology likes to cover its flash with a label, which wasn't peeled up to identify the device. So we don't know the flash capacity. The processor is the dual-core version of Freescale's "family of processors is designed to deliver complex application processing performance with exceptional feature integration and high-speed connectivity for IP networking and advanced media processing applications". As we found in the DS413 review, this SoC packs a pretty good punch. Power consumption measured 28 W with two WD RE4 2TB (WD2003FYYS) drives Synology supplied spun up and 8 W when the programmable drive spindown kicked in. Fan noise, in the default "Quiet" mode (the other two modes are "Cool" and "Low-Power") was barely audible and there was little idle drive noise in my quiet home office environment. So I rated the 213+' noise as very low. The 213+ supports all the features in Synology's DiskStation Manager (DSM) 4.1 OS. The DSM 4.1-2657 build used for testing has a very extensive feature list, which is described in Synology's DSM Highlight pages. See the DS1512+ review for a feature summary.